If the U.S. economy is getting better, then why are major retail chains closing thousands of stores? If we truly are in an “economic recovery”, then why do sales figures continue to go down for large retailers all over the country? Without a doubt, the rise of Internet retailing giants such as Amazon.com have had a huge impact. Today, there are millions of Americans that actually prefer to shop online. Personally, when I published my novel I made it solely available on Amazon. But Internet shopping alone does not account for the great retail apocalypse that we are witnessing. In fact, some retail experts estimate that the Internet has accounted for only about 20 percent of the decline that we are seeing. Most of the rest of it can be accounted for by the slow, steady death of the middle class U.S. consumer. Median household income has declined for five years in a row, but all of our bills just keep going up. That means that the amount of disposable income that average Americans have continues to shrink, and that is really bad news for retailers. And sadly, this is just the beginning. Retail experts are projecting that the pace of store closings will actually accelerate over the course of the next decade. So as you read this list below, please take note that things will soon get even worse. #1 As you read this article, approximately a billion square feet of retail space is sitting vacant in the United States. #2 Last week, Radio Shack announced that it was going to close more than a thousand stores. #3 Last week, Staples announced that it was going to close 225 stores. #4 Same-store sales at Office Depot have declined for 13 quarters in a row. #5 J.C. Penney has been dying for years, and it recently announced plans to close33 more stores. #6 J.C. Penney lost 586 million dollars during the second quarter of 2013 alone. #7 Sears has closed about 300 stores since 2010, and CNN is reporting that Sears is “expected to shutter another 500 Sears and Kmart locations soon”. #8 Overall, sales numbers have declined at Sears for 27 quarters in a row. #9 Target has announced that it is going to eliminate 475 jobs and not fill 700 positions that are currently empty. #10 It is being projected that Aéropostale will close about 175 stores over the next couple of years. #11 Macy’s has announced that it is going to be closing five stores and eliminating 2,500 jobs. #12 The Children’s Place has announced that it will be closing down 125 of its “weakest” stores by 2016. #13 Best Buy recently shut down about 50 stores up in Canada. #14 Video rental giant Blockbuster has completely shut down all of their stores. #15 It is being projected that sales at U.S. supermarkets will decline by 1.7 percent this year even as the overall population continues to grow. #16 McDonald’s has reported that sales at established U.S. locations were down 3.3 percent in January. #17 A home appliance chain known as “American TV” in the Midwest is going to be shutting down all 11 stores. David Cheesewright, CEO of Walmart International was speaking at the same presentation, and he pointed out that Walmart would try to protect its market share in the US – where the company had just issued an earnings warning. But most of the growth would have to come from its units outside the US. I mean, via these share buybacks? Alas, outside the US too, economies were limping along at best, and consumers were struggling and the operating environment was tough. “We’re seeing economies under stress pretty much everywhere we operate,” Cheesewright admitted. #19 In a recent CNBC article entitled “Time to close Wal-Mart stores? Analysts think so“, it was recommended that Wal-Mart should close approximately 100 “underperforming” supercenters in rural locations across America. 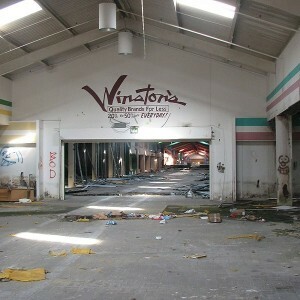 Within 15 to 20 years, retail consultant Howard Davidowitz expects as many as half of America’s shopping malls to fail. He predicts that only upscale shopping centers with anchors like Saks Fifth Avenue and Neiman Marcus will survive. So is there any hope that things will turn around? Well, if the U.S. economy started producing large numbers of good paying middle class jobs there would definitely be cause for optimism. Unfortunately, that is just not happening. On Friday, we were told that the U.S. economy added 175,000 jobs during the month of February. That sounds pretty good until you realize that it takes almost that many jobs each month just to keep up with population growth. The number of unemployed individuals 16 years and over increased by223,000 in February, according to the Bureau of Labor Statistics (BLS). In February, there were 10,459,000 unemployed individuals age 16 and over, which was up 223,000 from January, when there were 10,236,000 unemployed individuals. Meanwhile, the labor force participation rate continues to sit at a 35 year low, and a staggering 70 percent of all Americans not in the labor force are below the age of 55. And things look particularly depressing when you look at the labor force participation rate for men by themselves. In 1950, the labor force participation rate for men was sitting at about 87 percent. Today, it has dropped beneath 70 percent to a brand new all-time record low. 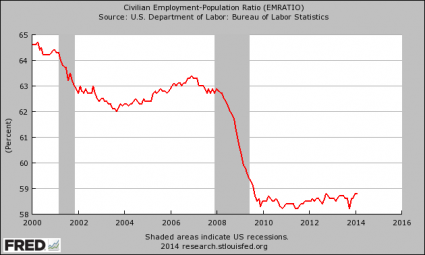 The truth is that there simply are not enough jobs for everyone anymore. If we were going to have a “recovery”, we should have had one by now. The share of Americans ages 22 to 27 with at least a bachelor’s degree in jobs that don’t require that level of education was 44 percent in 2012, up from 34 percent in 2001, the study found. Due to the fact that there are not enough middle class jobs to go around, the middle class has been steadily shrinking. In 2008, 53 percent of all Americans considered themselves to be “middle class”. Today, only 44 percent of all Americans consider themselves to be “middle class”. That is a pretty significant shift in just six years, don’t you think? For much more on this, please see my previous article entitled “28 Signs That The Middle Class Is Heading Toward Extinction“. Despite what the politicians and the mainstream media are telling you, the truth is that something is fundamentally wrong with our economy. On a gut level, most people realize this. According to one recent survey, only 35 percent of all Americans say that they are better off financially than they were a year ago. And according to a recent NBC News/Wall Street Journal poll, only 28 percent of all Americans believe that this country is moving in the right direction. The frightening thing is that this is about as good as things are going to get. The next great wave of the economic collapse is approaching, and when it strikes the plight of the middle class is going to get a whole lot worse.